Thank you for joining me as we count down to the next MFT release. We are five days away from the big day! All the new Stamps, Die-namics, and Stencils will be available on Tuesday, November 3 at 10:00 pm EST. Be sure to check out the MFT Blog to see all the new items being revealed today. Don't forget to leave a comment on the MFT Blog countdown posts, YOU could win one of the five $75.00 gift vouchers. I have another adorable Birdie Brown card to share with you today. 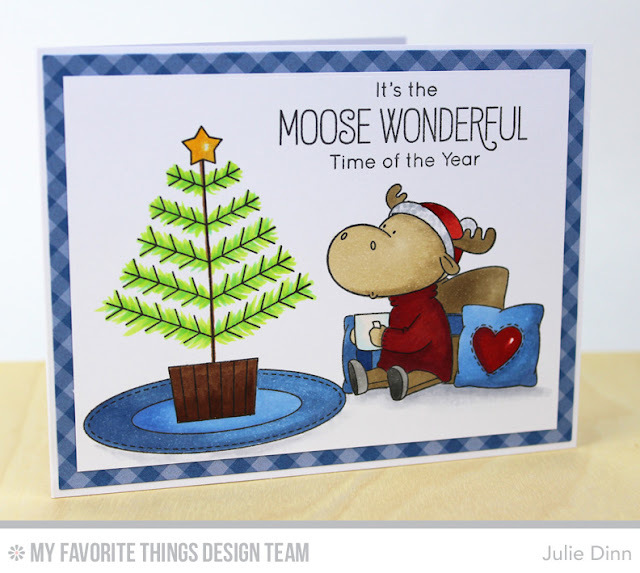 This one features the new Merry Christmoose stamp set. How cute is that little moose? This card required a fair bit of masking to create this cozy scene. All images were stamped in Black Licorice Hybrid Ink and were coloured with Copics. I added a touch of sparkle to a few spots with the Wink of Stella Pen. So cute, I better it was time consuming with all the masking you had to do. But it was well worth it the card turned out so good. I love all the blues used between coloring and the paper it makes the card pop. Such a cozy card with the wonderful moose anticipating Christmas day beside his beautiful Christmas tree! This is such a great card! I love the scene you created! Great coloring. I love your card. That gingham is just so perfect. Think I gotta get some. your color combo for you card is so pretty! super fun, love the colors! I love how you have him sitting against the pillows - looks so real the way you colored them! You are good girlie! Love it! Such a cute Christmas scene...settled in with his hot chocolate and pillows. Gingham adds to the warmth. This is such an adorable card!! The moose couldn't be any cuter!! Great job with the coloring!! The moose is so cute and adorable; I can't get enough of seeing him! The pillows behind his back add such a feeling of home to the card.